In 1979, Yamaha’s main competition was E-Z-Go and Harley Davidson (AMF). The body style changes over the years are a little more subtle than those of the E-Z-Go and Club Car, and because of these minor changes, many are wondering what model they DO have. What year is my Yamaha golf Cart? 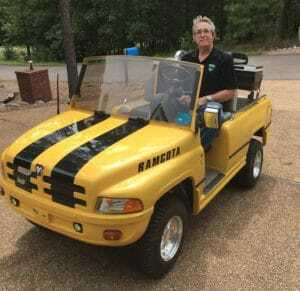 The year of your Yamaha golf cart can be found in this listing of the all of the models and the years they were produced. You will also be able to locate your serial number in the guide below. Yamaha entered the golf cart scene with the model G1, which sported a 2-cycle gas engine. Club Car was not even producing gas-powered carts at this time. The G1 was introduced in 1979 and production on the electric was discontinued in 1986, the gas model ended in 1989. The vehicle has bucket seats and the entire rear body and top swings up and back to access the drive train. The G1 is powered by 1. A 2 cycle gas engine with an oil injection system or 2. By a 36-volt electric motor & six 6V batteries. The G1 underwent several alterations over 10 years of production. The different models (and year of manufacture) are identified by the serial number and its prefix. The original ‘J10’ model is followed by the ‘J17’, the ‘J24’ and finally the ‘J31’ model. The engines and bodies stayed very similar throughout the G1 model design. The Yamaha G1 golf car has never had a standard ‘factory’ top assembly. There were several aftermarket manufacturers that provided the top section so, in order to get a wrap-around rain curtain to fit your G1, it’s pretty important to get the manufacturers name that produced YOUR cart top. The serial number is located near the driver’s side rear tire underneath the golf cart. 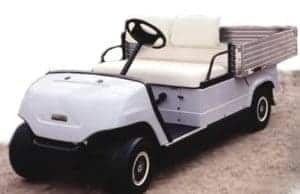 Early Yamaha Golf Carts with Model G2 serial numbers can be found under the rear bumper stamped into the square cross member of the frame on the passenger’s side of the vehicle. From 1988 through 1990 the G2 serial number can be found under the seat where the floorboard meets the engine compartment or under the front bumper on the frame of the golf cart. In 1986, Yamaha introduced the Sun Classic (or G3) with a 2-cycle engine or 36-volt electric system. It was the first golf vehicle made with an integrated roof and tempered-glass windshield complete with a wiper. Headlights, a front trunk, turn signals and custom dash, were standard equipment. The G3 was later replaced by a larger G5 Sun Classic. The serial number for the Yamaha G3 Sun Classic model golf cart is usually located just under the rear bumper on the passenger’s side. It is stamped onto a tin tag which is riveted to the frame. It should begin with either a “J46” prefix for electric models and a “J42” prefix for gas models. See below. The serial number this model golf cart is usually located on the front of the vehicle stamped into a tin tag and riveted to the frame, underneath the cart on the main cross member of the forward frame. The Yamaha G8 is a modified version of the fleet model G9 (See below). The G8 came out in 1990 and it exhibited a curved front cowl and rear fenders. It also has a long, full front bumper (side to side) and the seat bottom can be completely removed from the cart, whereas the G9 (and G2) seat bottom remains fixed to the seat pedestal and cannot be easily removed from the cart. The dash compartment interiors and dash trim are black. The G8 was retired in ’94. 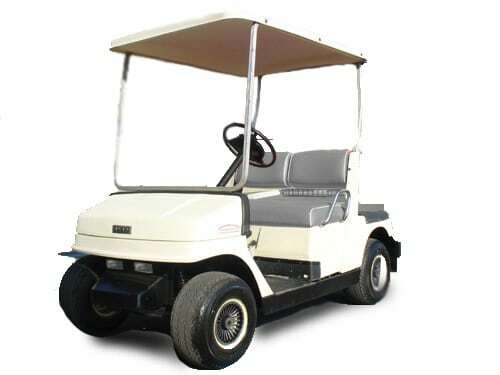 The G8 Golf Cart serial number is located under the passenger side seat towards the front of the golf cart. 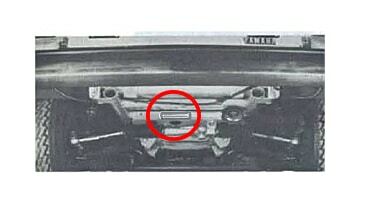 The G9 models started in 1991 with the prefix ‘JG5’, and the serial can be found just behind the back edge of the mat, under the seat pedestal in the engine compartment. The Model G11 is a utility Vehicle used for maintenance and light hauling. It is also called the “Yamahauler”. This model came with a heavy-duty steel front bumper and an aluminum box with a tailgate and a rear trailer hitch. In 1996 they installed a larger 301cc engine in the G11. These serial numbers can be found just under the glove box on the far left of the driver’s side of the vehicle. 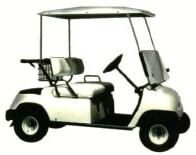 In 1995 the G14 was introduced followed in 1996 by the G16 and G19 which was Yamaha’s first 48-volt cart. The Yamaha G19 serial number is typically located inside the driver’s side glove compartment or under the rear bumper attached to the frame. The Yamaha G22 or G-MAX began production in 2003 and the serial number is located inside the driver’s side glove compartment. These serial numbers can be found on the passenger side of the vehicle near the rear fender(Gas) and under the seat on the driver’s side(Elec). Yamaha could be considered to be a new-comer in the Golf Cart market, but because they have been in the field of innovation and technology since 1887, they consider themselves as a leading manufacturer of golf carts and other products.